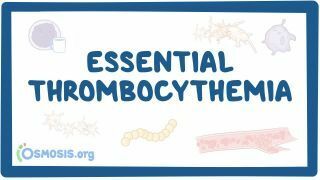 Osmosis: Essential thrombocythemia. (2019, April 20). Retrieved from (https://www.osmosis.org/learn/Essential_thrombocythemia). Essential thrombocythemia is a rare chronic blood disorder characterised by the overproduction of platelets by megakaryocytes in the bone marrow. It may, albeit rarely, develop into acute myeloid leukemia or myelofibrosis. It is one of four myeloproliferative disorders (disorders characterised by increased production of a particular line of blood cell). In essential thrombocytosis, patients with low risk of thrombosis are treated with (drug) . A 53-year-old woman is brought to the emergency department by ambulance following an acute onset of weakness earlier this morning. On examination, there is marked right-sided weakness in both her arms and her legs, and right-sided homonymous hemianopia. When asked about the onset of these symptoms, the woman is unable to properly explain the history due to slurred speech. Her past medical history includes DVT, pulmonary embolism, and breast cancer. Laboratory studies show hemoglobin 15.6 g/dL, platelet count 560,000/mm3, leukocyte count 16.0 x 109L. Based on the presentation and laboratory findings, which of this patient's genes is most likely to have a mutation?